Background: Casablanca is a 1942 black & white romantic drama directed by Michael Curtiz, and it was based on a stage play called ‘Everybody Comes to Rick’s’. Casablanca is a city located in the north-west area of Morocco and the film is set during the start of the Second World War. Those who were trapped in Europe and wished to escape did so by travelling to America via Lisbon, however, a direct route to Lisbon was not achievable by everyone. So instead, many travelled from Paris to Marseilles, across the Meditation Sea to Oran, then finally travelled across the land to reach French-occupied Morocco. Through money, luck or contacts many sought to obtain exit visas to Lisbon where they would then travel to America. Those who were not quite as lucky were forced to wait for some time in Casablanca in the hope that one day they too would obtain that lucky ticket. Claude Rains as Captain Louis Renault. The Plot: 1941, Rick Blaine owns an upscale nightclub in Casablanca, located under the flight path of those planes escaping to freedom. The club attracts an ecliptic mix of customers, refugees and those hunting refugees, German officials and members of The Third Reich. Though Rick is a neutral party in this affair he has previously taken sides, with connections to arms smuggling and fighting on the loyalist side of the Spanish Civil War. ‘Letters of Transit’ come into Rick’s possession after two German couriers are murdered, and Rick hides these letters in the club’s piano. These letters enable the user to freely travel around German controlled Europe and Portugal. Ilsa Lund and Victor Laszlo now enter the nightclub. Victor is a renowned fugitive Czech Resistance Leader, while Ilsa has a romantic past with Rick, evidenced when Ilsa approaches the club’s piano player Sam. Sam and Rick are old friends and by association Ilsa knows Rick is in the club, she asks Sam to play a song that has an emotional connection to Rick. Upon hearing the song Rick enters the scene to find Ilsa, he forbade Sam from playing the song in the past. Ilsa and Victor need the letters in order to safety pass through the various boarders to America so that Victor can continue his resistance work. 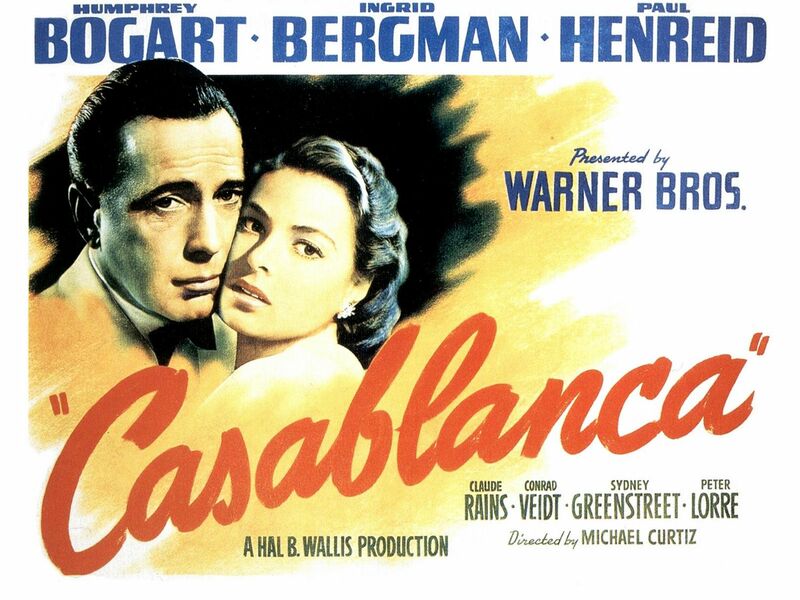 A Major Strasser, has also arrived in Casablanca to thwart Victor’s plan. Victor, after discussing travel arrangements with various underground members, suspects Rick to be the one in possession of the letters. He confronts Rick who in turn tells Victor to speak to his wife about the matter. Music begins playing downstairs in the nightclub, the Strasser officers are singing ‘Die Wacht am Rhein’ to which Victor orders the band to play ‘La Marseillaise’ in reply. The nightclub sings ‘La Marseillaise’ so enthusiastically that it drowns the sound of the Strasser’s men entirely. In response to Victor’s resistance actions Strasser orders the nightclub to be shut down. A flash back occurs explaining Rick and Ilsa’s past connection to one another. Rick and Ilsa first met in 1940 in Paris and quickly fell in love. Ilsa had previously been attached to Victor whom she believed to have died in attempting to escape a concentration camp. When German troops invade France, both Rick and Ilsa decide to leave, however, on the rainy day the two are due to depart, Ilsa is told that Victor is alive and in hiding and she therefore abandons Rick to seek Victor. Rick is notified of her departure by a letter Sam gives him at the rendezvous, in the letter Ilsa does not confide to Rick why she has left him, thus tormenting Rick. One night Ilsa comes to Rick and Rick agrees to help the couple, letting Ilsa believe that it will be Ilsa and Rick boarding the plane rather than Ilsa and Victor. Ilsa has fallen in love with Rick once more and wishes to stay with him. Victor unexpectedly arrives at the nightclub having narrowly avoided being arrested at a meeting, he seeks Ricks help, and, understanding the romantic connection between Rick and Ilsa, he wishes Rick to take Ilsa and flee the country using the letters. Captain Renault is a corrupt officer, but a good friend of Rick’s and a frequent visitor of the nightclub. When the police arrive at Rick’s nightclub to arrest Victor on false allegations, Rick persuades Renault to hold off on the arrest, promising a far superior charge on which to arrest Victor, possession of the letters. Renault does as he is asked, but once Victor has possession of the letters, Rick aims a gun at Renault in order to assist in the escape of Victor and Ilsa. The last scene of the film takes places at the airplane hangar, Strasser arrives having been tipped off by Renault at the club. He discovers Ilsa and Victor are already on the plane which is about to take off and moves to phone for backup. Rick shoots him, and when the rest of the police arrive, Renault tells them to “round up the usual suspects” thus leaving Rick Renault to walk away into the distance scot-free. Trivia: There are a number of iconic lines in this film that you have no doubt heard but maybe unaware as to their origin. “Of all the gin joints in all the world, she walks into mine”. “Louis, I think this is the beginning of a beautiful friendship”. Did You Know: The last scene of the film in the hangar is entirely shot on a soundstage, hence why it’s quite so misty in order to obscure the backdrop. Oscars: 1944 Best Picture, Best Director, Best Writing/Screenplay. Thank you, glad you liked them. Thought I would something a little extra this week.